This article is about learners. For other uses, see Student (disambiguation). In Nigeria, education is classified into four system known as a 6-3-3-4 system of education. It implies six years in primary school, three years in junior secondary, three years in senior secondary and four years in the university. However, the number of years to be spent in university is mostly determined by the course of study. Some courses have longer study length than others. Those in primary school are often referred to as pupils. Those in university, as well as those in secondary school, are being referred to as students. The Nigerian system of education also has other recognized categories like the polytechnics and colleges of education. The Polytechnic gives out National Diploma and Higher National Diploma certifications after a period of two years and/or four years of study respectively. Higher National Diploma (also known as HND) can be obtained in a different institution from where the National Diploma (also known as ND or OND) was obtained. However, the HND cannot be obtained without the OND certificate. On the other hand, colleges of education give out NCE (Nigerian Certificate in Education) after a two year period of study. In South Africa, education is divided into four bands: Foundation Phase (grades 1–3), Intermediate Phase (grades 4–6), Senior Phase (grades 7–9), and the Further Education and Training or FET Phase (grades 10–12). However, because this division is newer than most schools in the country, in practice, learners progress through three different types of school: primary school (grades 1–3), junior school (grades 4–7), and high school (grades 8–12). After the FET phase, learners who pursue further studies typically take three or four years to obtain an undergraduate degree or one or two years to achieve a vocational diploma or certificate. The number of years spent in university varies as different courses of study take different numbers of years. Those in the last year of high school (Grade 12) are referred to as 'Matrics' or are in 'Matric' and take the Grade 12 examinations accredited by the Umalusi Council (the South African board of education) in October and November of their Matric year. Exam papers are set and administered nationally through the National Department of Basic Education for government schools, while many (but not all) private school Matrics sit for exams set by the Independent Education Board (IEB), which operates with semi-autonomy under the requirements of Umalusi. (The assessment and learning requirements of both IEB and National exams are of roughly the same standard. The perceived better performance of learners within the IEB exams is largely attributable to their attending private, better-resourced schools with the much lower teacher: learner ratios and class sizes rather than because of fundamental differences in assessment or learning content). A school year for the majority of schools in South Africa runs from January to December, with holidays dividing the year into terms. Most public or government schools are 4-term schools and most private schools are 3-term school, but the 3-term government or public schools and 4-term private schools are not rare. Six years of primary school education in Singapore is compulsory. There are also schools which have the integrated program, such as River Valley High School (Singapore), which means they stay in the same school from Secondary 1 to Junior College 2, without having to take the "O" level examinations which most students take at the end of Secondary school. International Schools are subject to overseas curriculums, such as the British, American, Canadian or Australian Boards. Primary education is compulsory in Bangladesh. It is a near crime to not to send children to primary school when they are of age. But it is not a punishable crime (sending children to work instead of school is a crime). Because of the socio-economic state of Bangladesh, child labour is sometimes legal. But the guardian must ensure the primary education. Everyone who is learning in any institute or even online may be called a student in Bangladesh. Sometimes students taking undergraduate education are called undergraduates and students taking post-graduate education may be called post-graduates. Education is free in Brunei. Darussalam not limited to government educational institutions but also private educational institutions. There are mainly two types of educational institutions: government or public, and private institutions. Several stages have to be undergone by the prospective students leading to higher qualifications, such as Bachelor's Degree. It takes six and five years to complete the primary and secondary levels respectively. Upon completing these two crucial stages, students/pupils have freedom to progress to sixth-form centers, colleges or probably straight to employment. Students are permitted to progress towards university level programs in both government and private university colleges. Education in Cambodia is free for all the students who study in Primary School, Secondary School or High School. After basic education, students can opt to take a bachelor's (undergraduate) degree at a higher education institution (i.e. a college or university), which normally lasts for four years though the length of some courses may be longer or shorter depending on the institution. In India school is categorized in these stages: Pre-primary (Nursery, Lower Kindergarten or LKG, Upper Kindergarten or UKG), Primary (Class 1-5), Secondary (6-10) and Higher Secondary (11-12). For undergraduate it is 3 years except Engineering (BTech or BE) which is of 4 years degree course, Architecture (B.Arch) which is 5 years degree course and Medical (MBBS) which is of 4.5 years degree course and 1 year Internship, so 5.5 years. In Nepal 12-year school is categorized in three stages: Primary school, Secondary school and Higher Secondary school. For college it averages four years for a bachelor's degree (except BVSc and AH which is five years programme and MBBS which is a five and half years programme) and two years master's degree. In Pakistan, 12-year school is categorized in three stages: Primary school, Secondary school and Higher Secondary school. It takes five years for a student to graduate from Primary school, five years for Secondary school and five years for Higher Secondary school (also called College). Most bachelor's degrees span over four years, followed by a two years master's degree. The Philippines is currently in the midst of a transition to a K-12 (also called K+12) basic education system. Education ideally begins with one year of kinder. Once the transition is complete, elementary or grade school comprises grades 1 to 6. Although the term student may refer to learners of any age or level, the term 'pupil' is used by the Department of Education to refer to learners in the elementary level, particularly in public schools. Secondary level or high school comprises two major divisions: grades 7 to 10 will be collectively referred to as 'junior high school', whereas grades 11 to 12 will be collectively referred to as 'senior high school'. The Department of Education refers to learners in grade 7 and above as students. In Iran 12-year school is categorized in two stages: Elementary school and High school. It takes six years for a student to graduate from elementary school and six years for high school. High school study is divided into two part: junior and senior high school. In senior high school, student can choose between the following six fields: Mathematics and physics, Science, Humanities, Islamic science, Vocational, or Work and knowledge. After graduating from high school, students acquire a diploma. Having a diploma, a student can participate in the Iranian University Entrance Exam or Konkoor in different fields of Mathematics, Science, Humanities, languages, and art. The university entrance exam is conducted every year by National Organization of Education Assessment, an organization under the supervision of the Ministry of Science, Research and Technology which is in charge of universities in Iran. Members of the Bahá'í religion, a much-persecuted minority, are officially forbidden to attend university, in order to prevent members of the faith becoming doctors, lawyers or other professionals; however, Muslim, Christian, Jewish, and Zoroastrian people are allowed entry to universities. In Australia, Pre-school is optional for three and four year olds. 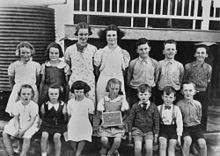 At age five, children begin compulsory education at Primary School, known as Kindergarten in New South Wales, Preparatory School (prep) in Victoria, and Reception in South Australia, students then continue to year one through six (ages 6 to 12). Before 2014, primary school continued on to year seven in Western Australia, South Australia and Queensland. However, the state governments agreed that by 2014, all primary schooling will complete at year six. Students attend High School in year seven through twelve (ages 13 – 18). After year twelve, students may attend tertiary education at University or vocational training at TAFE (Technical and Further Education). In New Zealand, after kindergarten or pre-school, which is attended from ages three to five, children begin primary school, 'Year One', at five years of age. Years One to Six are Primary School, where children commonly attend local schools in the area for that specific year group. Then Year Seven and Year Eight are Intermediate, and from Year Nine until Year Thirteen, a student would attend a secondary school or a college. Europe uses the traditional, first form, second form, third form, fourth form, fifth form and six form grade system which is up to age eleven. In Finland a student is called "opiskelija" (plural being 'opiskelijat'), though children in compulsory education are called "oppilas" (plural being 'oppilaat'). First level of education is "esikoulu" (literally 'preschool'), which used to be optional, but has been compulsory since the beginning of year 2015. Children attend esikoulu the year they turn six, and next year they start attending "peruskoulu" (literally "basic school", corresponds to American elementary school, middle school and junior high), which is compulsory. Peruskoulu is divided to "alakoulu" (years 1 through 6) and "yläkoulu" (years 7 through 9). After compulsory education most children attend second level education (toisen asteen koulutus), either lukio (corresponds to high school) or ammattikoulu (Vocational School), at which point they are called students (opiskelija). Some attend "kymppiluokka", which is a retake on some yläkoulu's education. To attend ammattikorkeakoulu (University of applied sciences) or a university a student must have a second level education. The recommended graduation time is five years. First year students are called "fuksi" and students that have studied more than five years are called "N:nnen vuoden opiskelija" (Nth year student). The generic term "étudiant" (lit. student) applies only to someone attending a University or a school of a similar level, that is to say pupils in a cursus reserved to people already owning a Baccalauréat. The general term for a person going to primary or secondary school is élève. In some French higher education establishments, a bleu or "bizuth" is a first-year student. Second-year students are sometimes called "carrés" (squares). Some other terms may apply in specific schools, some depending on the classe préparatoire aux grandes écoles attended. In Germany, the German cognate term Student (male) or "Studentin" (female) is reserved for those attending a university. University students in their first year are called Erstsemester or colloquially Ersties ("firsties"). Different terms for school students exist, depending on which kind of school is attended by the student. The general term for a person going to school is Schüler or Schülerin. They begin their first four years in primary school or Volksschule. They then graduate to a secondary school called Gymnasium, which is a university preparatory school. Students attending this school are called Gymnasiasten, while those attending other schools are called Hauptschüler or Realschüler. Students who graduate with the Abitur are called Abiturienten. The abbreviation stud. + the abbreviation of the faculty p. e. phil. for philosophiae is a post-nominal for all students of a baccalaureus course. The abbreviation cand. for candidatus + the abbreviation of the faculty is given as a post-nominal to those close to the final exams. First name surname, stud. phil. or First name surname, cand. jur. In Ireland, pupils officially start with primary school which consists of eight years: junior infants, senior infants, first class to sixth class (ages 5–11). After primary school, pupils proceed to the secondary school level. Here they first enter the junior cycle, which consists of first year to third year (ages 11–14). At the end of third year, all students must sit a compulsory state examination called the Junior Certificate. After third year, pupils have the option of taking a "transition year" or fourth year (usually at age 15-16). In transition year pupils take a break from regular studies to pursue other activities that help to promote their personal, social, vocational and educational development, and to prepares them for their role as autonomous, participative and responsible members of society. It also provides a bridge to enable pupils to make the transition from the more dependent type of learning associated with the Junior Cert. to the more independent learning environment associated with the senior cycle. After the junior cycle pupils advance to the senior cycle, which consists of fifth year and sixth year (usually ages between 16 and 18). At the end of the sixth year a final state examination is required to be sat by all pupils, known as the Leaving Certificate. The Leaving Cert. is the basis for all Irish pupils who wish to do so to advance to higher education via a points system. A maximum of 625 points can be achieved. All higher education courses have a minimum of points needed for admission. At Trinity College, Dublin under-graduate students are formally called "junior freshmen", "senior freshmen", "junior sophister" or "senior sophister", according to the year they have reached in the typical four year degree course. Sophister is another term for a sophomore, though the term is rarely used in other institutions and is largely limited to Trinity College Dublin. At university, the term "fresher" is used to describe new students who are just beginning their first year. The term, "first year" is the more commonly used and connotation-free term for students in their first year. The week at the start of a new year is called "Freshers' Week" or "Welcome Week", with a programme of special events to welcome new students. An undergraduate in the last year of study before graduation is generally known as a "finalist." In Italian, a matricola is a first-year student. Some other terms may apply in specific schools, some depending on the liceo classico or liceo scientifico attended. 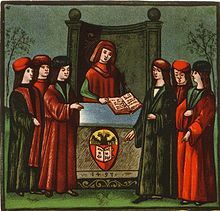 According to the goliardic initiation traditions the grades granted (following approximately the year of enrollment at university) are: matricola (freshman), fagiolo (sophomore), colonna (junior), and anziano (senior), but most of the distinctions are rarely used outside Goliardia. 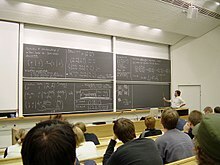 In Sweden, only those studying at university level are called students (student, plural studenter). To graduate from upper secondary school (gymnasium) is called ta studenten (literally "to take the student"), but after the graduation festivities, the graduate is no longer a student unless he or she enrolls at university-level education. At lower levels, the word elev (plural elever) is used. As a general term for all stages of education, the word studerande (plural also studerande) is used, meaning 'studying [person]'. Traditionally, the term "student" is reserved for people studying at university level in the United Kingdom. At universities in the UK, the term "fresher" is used informally to describe new students who are just beginning their first year. Although it is not unusual to call someone a fresher after their first few weeks at university, they are typically referred to as "first years" or "first year students". In England and Wales, primary school begins with an optional "nursery" year followed by reception and then move on to "year one, year two" and so on until "year six". In state schools, children join secondary school when they are 11–12 years old in what used to be called "first form" and is now known as "year 7". They go up to year 11 (formerly "fifth form") and then join the sixth form, either at the same school or at a separate sixth form college. A pupil entering a private, fee-paying school (usually at age 13) would join the "third form" — equivalent to year 9. Many schools have an alternate name for first years, some with a derogatory basis, but in others acting merely as a description — for example "shells" (non-derogatory) or "grubs" (derogatory). In Northern Ireland and Scotland, it is very similar but with some differences. Pupils start off in nursery or reception aged 3 to 4, and then start primary school in "P1" (P standing for primary) or year 1. They then continue primary school until "P7" or year 7. After that they start secondary school at 11 years old, this is called "1st year" or year 8 in Northern Ireland, or "S1" in Scotland. They continue secondary school until the age of 16 at "5th year", year 12 or "S5", and then it is the choice of the individual pupil to decide to continue in school and (in Northern Ireland) do AS levels (known as "lower sixth") and then the next year to do A levels (known as "upper sixth"). In Scotland, students aged 16–18 take Highers, followed by Advanced Highers. Alternatively, pupils can leave and go into full-time employment or to start in a technical college. Education in Quebec differs from the other provinces in that it has an école primaire (literally "primary school") consisting of grades 1-6, and an école secondaire (literally "secondary school") consisting of secondaries I-V. Secondaries I-V are equivalent to grades 7-11. A student graduating from high school (grade 11) can then either complete a three-year college program or attend a two-year pre-university program required before attending university. In some English High Schools, as well as in most French schools, high school students will refer to secondary 1-5 as year one through five. So if someone in Secondary three is asked "what grade/year are you in?" they will reply "three" or "sec 3". It is presumed that the person asking the question knows that they are not referring to "Grade 3" but rather "Secondary 3". This can be confusing for those outside of Quebec. In some provinces, grades 1 through 6 are called "elementary school", grades 6 to 8 are called "middle school" or "junior high school", and grades 9 to 12 are considered high school. Other provinces, such as British Columbia, mainly divide schooling into elementary school (Kindergarten to grade 7) and secondary school (grades 8 through 12). In Alberta and Nova Scotia, elementary consists of kindergarten through grade 6. Junior high consists of Grades 7-9. High school consists of Grades 10-12. In English provinces, the high school (known as academy or secondary school) years can be referred to simply as first, second, third and fourth year. Some areas call it by grade such as grade 10, grade 11 and grade 12. The difference between college and university is significantly different from in the United States or even the United Kingdom. A Canadian college is more similar to an American community college but also the British, French and other European and British Commonwealth such as Australian and New Zealand etc., on the other hand. In contrast, a Canadian university is also quite comparable to an American university as well as many other universities among the English-speaking world and Francosphere. In Canada, colleges are generally geared for individuals seeking applied careers, while universities are geared for individuals seeking more academic careers. University students are generally classified as first, second, third or fourth-year students, and the American system of classifying them as "freshmen", "sophomores", "juniors" and "seniors" is seldom used or even understood in Canada. In some occasions, they can be called "senior ones", "twos", "threes" and "fours". In the United States, the first official year of schooling is called kindergarten, which is why the students are called kindergarteners. Kindergarten is optional in most states, but few students skip this level. Pre-kindergarten, also known as "preschool" (and sometimes shortened to "Pre-K") is becoming a standard of education as academic expectations for the youngest students continue to rise. Many public schools offer pre-kindergarten programs. In the United States there are 12 years of mandatory schooling. The first eight are solely referred to by numbers (e.g. 1st grade, 5th grade) so students may be referred to as 1st graders, 5th graders, then once in middle school before high school you are ratio referred to as 6th, 7th, 8th graders. Upon entering high school, grades 9 through 12 (high school) also have alternate names for students, namely freshman, sophomore, junior and senior. The actual divisions of which grade levels belong to which division (whether elementary, middle, junior high or high school) is a matter decided by state or local jurisdictions. Accordingly, college students are often called Freshmen, Sophomores, Juniors and Seniors (respectively), unless their undergraduate program calls for more than the traditional 4 years. The first year of college or high school is referred to as Freshman year. A freshman (slang alternatives that are usually derogatory in nature include "fish", "new-g", "fresher", "frosh", "newbie", "freshie", "snotter", "fresh-meat", "skippie", etc.) is a first-year student in college, university or high school. In the U.S., a sophomore, also called a "soph," is a second-year student. Outside the United States, the term Sophomore is rarely used, with second-year students simply called "second years". Folk etymology indicates that the word means "wise fool"; consequently "sophomoric" means "pretentious, bombastic, inflated in style or manner; immature, crude, superficial" (according to the Oxford English Dictionary). It is widely assumed to be formed from Greek "sophos", meaning "wise", and "moros" meaning "foolish", although the etymology suggests an origin from the now-defunct "sophumer", an obsolete variant of "sophism". In the U.S., a Junior is a student in the penultimate (usually third) year and a Senior is a student in the last (usually fourth) year of college, university, or high school. A student who takes more than the normal number of years to graduate is sometimes referred to as a "super senior". This term is often used in college, but can be used in high school as well. The term underclassman is used to refer collectively to Freshmen and Sophomores, and Upperclassman to refer collectively to Juniors and Seniors, sometimes even Sophomores. The term Middler is used to describe a third-year student of a school (generally college) that offers five years of study. In this situation, the fourth and fifth years would be referred to as Junior and Senior years, respectively, and the first two years would be the Freshman and Sophomore years. A graduate student is a student who continues his/her education after graduation. Some examples of graduate programs are: business school, law school, medical school, and veterinary school. Degrees earned in graduate programs include the Master’s degree, a research doctoral degree, or a first professional degree. Students attending vocational school focus on their jobs and learning how to work in specific fields of work. A vocational program typically takes much less time to complete than a four-year degree program, lasting 12–24 months. Liberal Arts that are required in four-year Universities are less important to these students because the skills necessary for their careers take precedence in order for a timely completion of the program. Students have their own current of politics and activism on and off campus. The student rights movement has centered itself on the empowerment of students similar to the labor movement. University students have been associated with pranks and japes since the creation of universities in the Middle Ages. These can often involve petty crime, such as the theft of traffic cones and other public property, or hoaxes. It is also not uncommon for students from one school to steal or deface the mascot of a rival school. In fact, pranks play such a significant part in student culture that numerous books have been published that focus on the issue. The term 'pupil' (originally a Latin term for a minor as the ward of an adult guardian, etc.) is used in some Commonwealth primary and secondary schools (particularly in England and Wales) instead of "student", but once attending further education (at a sixth-form college) or higher education (at university for example), the term "student" is standard. The term pupil is also used in the Philippines by the Department of Education to refer to learners currently in elementary school; the term student is used for by the Department of Education for learners in high school. International Students' Day (17 November) remembers the anniversary of the 1939 Nazi storming of the University of Prague after student demonstrations against the German occupation of Czechoslovakia. Germans closed all Czech universities and colleges, sent over 1200 students to Nazi concentration camps, and had nine student leaders executed (on November 17). ^ "وزارت علوم، تحقیقات و فناوری - صفحات - صفحه اصلی". ^ "Online Etymology Dictionary". Etymonline.com. Retrieved 2012-12-08. ^ "Minnesota Vocational Schools, Trade Schools, Technical Schools - RWM.org". ^ "Seeley G. Mudd Manuscript Library: FAQ Student pranks". Princeton.edu. 24 April 2012. Archived from the original on 2 December 2012. Retrieved 8 December 2012. ^ "Blog Archive » Student Pranks". Kiwiblog. 2006-10-21. Retrieved 2012-12-08. ^ "Student Pranks! Attention!". Essaymama. 2014-09-03. ^ Ayala, Jamie, "Sticky student prank injures teacher" Archived 2007-09-27 at the Wayback Machine, FOX11AZ.com, Tucson, Arizona, 14 June 2007. ^ "Nightmare on student street". ^ "The 17th of November: Remembering Jan Opletal, martyr of an occupied nation". Radio Prague.